Welcome back to our Wilson Care blog page! As a Honolulu health care agency that prides itself on providing expert care to elderly and disabled folks, we’re passionate about giving your family the help that it desperately needs. For so many of our amazing clients, care has been on the shoulders of family members, which as you can assume, can become stressful, frustrating, exhausting, and even disheartening at times. We understand the conflict; you love and deeply care about your disabled or elderly loved one but the burden of care has started to weigh on you and take a toll on your family’s quality of life. Fear not — Wilson Care Group (Wilson Home Care and Wilson Senior Living) is Hawaii’s best option for at home care and a senior living facility and we’d love to step into your situation and help you out. Whether you need a home care aide to come to your loved one’s home on a daily basis or you’re realizing that it’s time to seek extended, full-time care for them, you can’t go wrong with Wilson Care. Reach out to us today to start care and if you’re looking for an amazing place to work in Honolulu, consider working for Wilson Care as a home health care aide. Our healthcare related jobs are perfect for the qualified individual who is seeking rewarding, enjoyable employment in which you make a difference on a daily basis. To learn more about home health care at Wilson Care, contact us today! There are myths and misconceptions about so many things in our lives. We tend to believe what we hear, especially if the source is someone we trust. Why should elderly care be any different? Whether you’ve had family members who have a home health care aide or you’ve worked in the Hawaii homecare sector, you probably understand that this, like anything else, tends to have its own set of myths and misconceptions. People believe what they want to believe when it comes to health care and elderly care specifically, but what is the truth? In our two-part blog series, we’re going to explore some of the biggest myths regarding elderly home care. Continue reading to learn more and set the record straight! Many people mistakenly believe that for a family to seek a Honolulu home health care aide or a senior living facility, their elderly or disabled loved one must need full-time, 24-hour care. However, many families find that care can be appropriate and appreciated even when the aging individual just needs help for a few hours per day. Some families don’t want their elderly loved one to be alone all the time, so they’ll talk to a home health care aide about companionship. Whether you need help with your disabled or aging relative for a few hours per day, or you need some other level of care, reach out to Wilson Care today! While our most basic home health care aides are trained to help with the more basic tasks, many home care aides can do so much more! Among our Honolulu home care aides are nurse aides — those who are equipped to help with things like meal preparation, medication reminders, light housekeeping, and personal care. We have skilled nurses — those who can help with wound care, pain management, injections, G-tube feeding, and so much more. We also provide medical service professionals. If you curious about the many medical tasks that our home care personnel can help with, contact Wilson Care in Honolulu today! 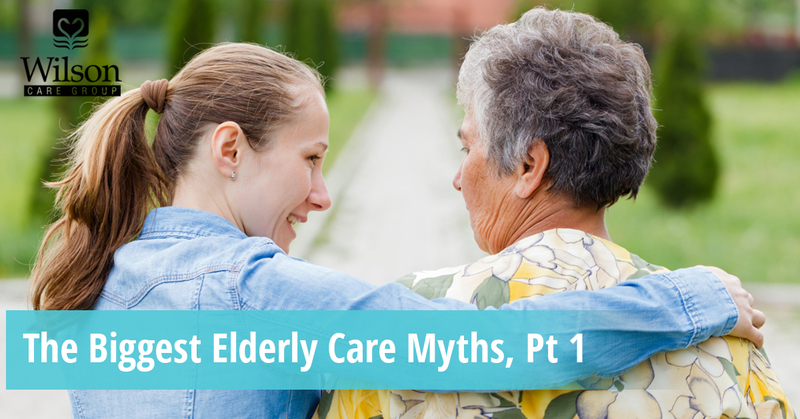 Though we’ve only touched on two of these myths, we’ll continue discussing some of the biggest misconceptions regarding elderly care in part two of our blog series. In the meantime, check out our website to learn about some of our amazing home health care services here in Honolulu. We also have a high-quality senior care facility for residents who need around the clock care. Whatever level of care your elderly loved one needs, Wilson Care is here to help. Contact us today to learn more. And if you’re looking for a CNA job or a career as a home health care aide, check out our career opportunities at Wilson Care!